The Genesis G70 is a luxury compact sedan that trades equally on value and prestige. It’s a four-door message that Genesis can run with the big boys. It arrives in 2018. With the G70, Genesis takes on imposing luxury bigwigs like the Mercedes-Benz C-Class, BMW 3-Series, and Audi A4 at the game they invented: sport luxury compact. The G70 is sized within inches of all three. In its first year on sale, the Genesis G70 was named the North American Car of the Year. The G70 has dashes of the sedans that preceded it in the Genesis stable—the G80 and G90—but strikes out on a more aggressive tip than those stuffed shirts. 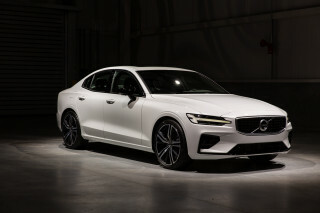 The G70’s long hood is borrowed from the related Kia Stinger, but its turned-down nose and flared intakes are the first hallmarks for the new sedan to the new brand. We expect the others to follow. The G70’s body sides keep the car in constant motion even when it’s parked; gills behind the front wheel look like a leg cocked, ready to run in a new direction. Under the hood, a 2.0-liter turbo-4 or 3.3-liter twin-turbocharged V-6 provide motivation with 252 or 365 horsepower respectively. An 8-speed automatic with paddle shifters is the most likely companion for either engine, but a 6-speed manual is available for rear-drive, turbo-4 models if shoppers prefer to go the hard way. 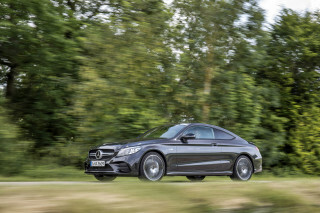 With the manual, the turbo-4 gets a power bump to 255 hp. 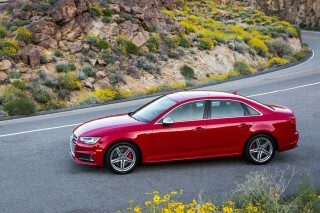 Rear-wheel drive is standard on both powertrains, all-wheel drive is available. 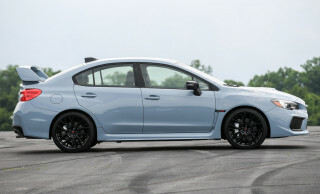 All V-6 and the 4-cylinder Sport trim can shift power through a limited-slip rear differential for better cornering and composure, but all versions get launch control for quick getaways. 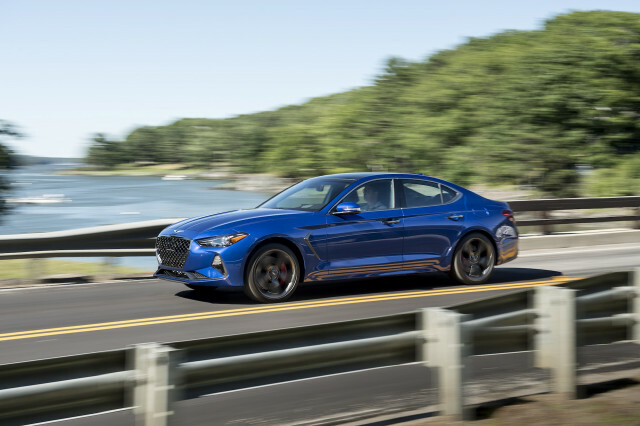 Although the G70 borrows the powerplants and drivelines from the Kia Stinger, the Genesis sedan chops about three inches from the wheelbase and nearly six inches from the overall length compared to the Stinger. Like the rest of the Genesis lineup, the G70 is awash in leather (real or synthetic) and soft surfaces. Like the G80 and G90, the G70 aims for top safety scores from federal and independent testers and includes standard active safety features such as automatic emergency braking, blind-spot monitors, and active lane control. The G70 offers compelling features for less money than the competition but doesn’t skimp on the top-shelf stuff either. Bigger 19-inch wheels, uprated Brembo brakes, a premium audio system from Lexicon, and summer tires are all available for the G70. The G70 is rated by the EPA in the low- to mid-20s for combined fuel economy. The most efficient version, a rear-drive 2.0-liter turbo-4 with an automatic transmission, has been scored at 22 mpg city, 30 highway, 25 combined by the EPA.